Fibrinogen is a 340-kD glycoprotein that is synthesized in the liver and circulates in plasma at a concentration of 2-4 g/L, with a half-life of 4 days. The fibrinogen molecule is a hexamer, consisting of 3 paired polypeptide chains: A-α, B-β, and γ; A and B refer to specific polypeptides on 2 of the chains. Synthesis of the protein in hepatocytes is under the control of 3 genes (one for each chain), FGA, FGB, and FGG, located within 50 kilobases (kb) on chromosome 4 (4q). The primary physiologic role of fibrinogen is in hemostasis. In the final step of the coagulation cascade, fibrinogen is converted to fibrin, with formation of a fibrin clot. The first step in this conversion is thrombin cleavage of fibrinopeptides A and B from the fibrinogen α and β chains; the residual molecule is referred to as fibrin monomer. A loose fibrin clot develops as fibrin monomers spontaneously polymerize. The formation of a firm insoluble fibrin gel depends on cross-linking of the polymer by the transglutaminase activity of factor XIIIa (see the image below). The conversion of soluble fibrinogen to insoluble fibrin. The fibrin clot has an essential role in limiting bleeding at sites of blood vessel injury; it also provides the structure for assembly and activation of the fibrinolytic proteins. 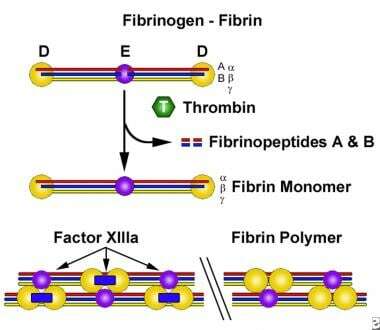 Although the primary function of fibrinogen is in fibrin clot formation, it has a multitude of other functions, including nonsubstrate thrombin binding, platelet aggregation, and fibrinolysis. Exposure of its nonsubstrate thrombin-binding sites after fibrin clot formation promotes the antithrombotic properties of fibrinogen. Therefore, disorders of fibrinogen may be associated with either a bleeding or a thrombotic predisposition. Mutations impacting fibrinogen synthesis or processing give rise to quantitative fibrinogen deficiencies, while mutations causing abnormal polymerization, cross-linking, or assembly of the fibrinolytic system lead to qualitative defects. Genetic defects and pathogenic mechanisms that have been identified include deletions, point mutations resulting in premature termination codons, missense mutations disturbing fibrinogen assembly or secretion, and unilateral isodisomy related to a significant deletion. Although mutations have been found in all three of the fibrinogen genes, the most common defects are aberrant splicing and deletion mutations in the fibrinogen A gene. Mutation-related molecular defects, identified through studies of specific mutations, include truncated α or γ chains or aberrantly folded β chains. Mutations can interfere with peptide synthesis or assembly of the fibrinogen hexameric complex and its secretion from the hepatocyte. [8, 9] These disorders are usually diagnosed in the newborn period, when they can present with umbilical cord bleeding. Congenital dysfibrinogenemia is the result of mutations that give rise to functional abnormalities. The presence of an associated bleeding tendency or an increased risk of thrombosis depends on the effect of the specific mutation. Type I (quantitative) fibrinogen deficiencies are generally inherited as autosomal recessive traits, whereas type II (qualitative) dysfibrinogenemias are inherited as autosomal dominant disorders in most cases. There is a strong correlation between fibrinogen activity level and severity of bleeding. Abnormalities at the thrombin cleavage site of the Aα chain result in impaired release of fibrinopeptide A, inhibiting the conversion of fibrinogen to fibrin. Absent or slow fibrinopeptide release with delayed polymerization of the fibrin monomers has been associated with mutations in all 3 of the fibrinogen genes. Abnormal fibrinogens that exhibit defective cross-linking by factor XIIIa have been associated with abnormal wound healing. Impaired fibrinopeptide B release results in abnormalities of polymerization that are associated with thrombotic events. Abnormalities that interfere with plasminogen binding or activation on the fibrin clot result in reduced fibrinolysis and are associated with clinical thrombosis. Defective fibrin binding of thrombin (a process that normally limits thrombin activity) results in prolonged activity of unbound thrombin, leading to amplification of fibrin clot formation and enhanced platelet activation. Mutations may be clinically silent. A North American Registry of Rare Bleeding Disorders has been successful in collecting valuable information on inherited fibrinogen disorders and other rare bleeding disorders, with respect to disease prevalence, genotyping frequency, diagnostic events, clinical manifestations, treatment, and prophylaxis strategies, as well as disease and treatment-related complications. Among all the reported cases of fibrinogen disorders in this registry, afibrinogenemia accounted for 24% of cases, hypofibrinogenemia accounted for 38%, and dysfibrinogenemia accounted for 38%. More recently, other resources for clinicians include the Rare Coagulation Disorders Resource Room. The frequency of afibrinogenemia is estimated to be 1-2 cases per million people; a high rate of consanguinity has been reported. Inherited dysfibrinogenemia in the general population is rare, but determination of the true incidence is difficult because many patients are asymptomatic. In addition to the North American Registry, several other recent registries from Italy, Iran, and the United Kingdom have greatly improved understanding of the clinical spectrum of presentation. In one large registry of cases, at least half of the patients were asymptomatic. Less than 1% of patients with venous thrombosis who were evaluated for dysfibrinogenemia were found to have this abnormality. A registry in Europe is also collecting data on this rare disorder. Afibrinogenemia is autosomal recessive, with a male-to-female ratio of 1:1. Dysfibrinogenemias may manifest either autosomal recessive or autosomal dominant inheritance. Afibrinogenemia poses a major risk during pregnancy and after delivery. Indeed, dysfibrinogenemia and thrombosis may be overrepresented in women because of the increased risk of thrombosis associated with pregnancy and the postpartum period. Hypofibrinogenemia (ie, less severely reduced fibrinogen levels) is associated with fewer bleeding episodes and may be first diagnosed at the time of a traumatic or surgical challenge that results in bleeding. Dysfibrinogenemias are commonly diagnosed in adulthood. Bolton-Maggs PH, Perry DJ, Chalmers EA, et al. The rare coagulation disorders--review with guidelines for management from the United Kingdom Haemophilia Centre Doctors' Organisation. Haemophilia. 2004 Sep. 10(5):593-628. [Medline]. Roberts HR, Stinchcombe TE, Gabriel DA. The dysfibrinogenaemias. Br J Haematol. 2001 Aug. 114(2):249-57. [Medline]. Tiscia GL, Margaglione M. Human Fibrinogen: Molecular and Genetic Aspects of Congenital Disorders. Int J Mol Sci. 2018 May 29. 19 (6):[Medline]. [Full Text]. Neerman-Arbez M, Casini A. Clinical Consequences and Molecular Bases of Low Fibrinogen Levels. Int J Mol Sci. 2018 Jan 8. 19 (1):[Medline]. [Full Text]. Casini A, Neerman-Arbez M, Ariens RA, de Moerloose P. Dysfibrinogenemia: from molecular anomalies to clinical manifestations and management. J Thromb Haemost. 2015 Jun. 13 (6):909-19. [Medline]. [Full Text]. Asselta R, Duga S, Tenchini ML. The molecular basis of quantitative fibrinogen disorders. J Thromb Haemost. 2006 Oct. 4(10):2115-29. [Medline]. Acharya SS, Dimichele DM. Rare inherited disorders of fibrinogen. Haemophilia. 2008 Nov. 14(6):1151-8. [Medline]. [Full Text]. Kirihara T, Fujikawa Y, Takeda W, Kurihara T, Sato K, Ueki T, et al. Congenital dysfibrinogenemia coincidentally diagnosed at the onset of chronic myelogenous leukemia. Rinsho Ketsueki. 2014 May. 55(5):541-5. [Medline]. Sumitha E, Jayandharan GR, Arora N, Abraham A, David S, Devi GS, et al. Molecular basis of quantitative fibrinogen disorders in 27 patients from India. Haemophilia. 2013 Jul. 19(4):611-8. [Medline]. Zhou J, Ding Q, Chen Y, et al. Clinical features and molecular basis of 102 Chinese patients with congenital dysfibrinogenemia. Blood Cells Mol Dis. 2015 Dec. 55 (4):308-15. [Medline]. Acharya SS, Coughlin A, Dimichele DM,. Rare Bleeding Disorder Registry: deficiencies of factors II, V, VII, X, XIII, fibrinogen and dysfibrinogenemias. J Thromb Haemost. 2004 Feb. 2(2):248-56. [Medline]. Haverkate F, Samama M. Familial dysfibrinogenemia and thrombophilia. Report on a study of the SSC Subcommittee on Fibrinogen. Thromb Haemost. 1995 Jan. 73(1):151-61. [Medline]. Casini A, Blondon M, Lebreton A, et al. Natural history of patients with congenital dysfibrinogenemia. Blood. 2015 Jan 15. 125 (3):553-61. [Medline]. [Full Text]. Kaur M, Kumar N, Bose SK, Rajendran A, Trehan A, Ahluwalia J. Congenital afibrinogenemia in a new born: a rare cause for bleeding. Blood Coagul Fibrinolysis. 2014 Feb 6. [Medline]. Peyvandi F, Haertel S, Knaub S, Mannucci PM. Incidence of bleeding symptoms in 100 patients with inherited afibrinogenemia or hypofibrinogenemia. J Thromb Haemost. 2006 Jul. 4(7):1634-7. [Medline]. Parameswaran R, Dickinson JP, de Lord S, et al. Spontaneous intracranial bleeding in two patients with congenital afibrinogenaemia and the role of replacement therapy. Haemophilia. 2000 Nov. 6(6):705-8. [Medline]. Martinez J. Congenital dysfibrinogenemia. Curr Opin Hematol. 1997 Sep. 4(5):357-65. [Medline]. Verhovsek M, Moffat KA, Hayward CP. Laboratory testing for fibrinogen abnormalities. Am J Hematol. 2008 Dec. 83(12):928-31. [Medline]. Jacquemin M, Vanlinthout I, Van Horenbeeck I, et al. The amplitude of coagulation curves from thrombin time tests allows dysfibrinogenemia caused by the common mutation FGG-Arg301 to be distinguished from hypofibrinogenemia. Int J Lab Hematol. 2017 Jun. 39 (3):301-7. [Medline]. Van Cott EM, Smith EY, Galanakis DK. Elevated fibrinogen in an acute phase reaction prolongs the reptilase time but typically not the thrombin time. Am J Clin Pathol. 2002 Aug. 118(2):263-8. [Medline]. Cunningham MT, Brandt JT, Laposata M, Olson JD. Laboratory diagnosis of dysfibrinogenemia. Arch Pathol Lab Med. 2002. 126:499-505. [Medline]. Peyvandi F, Cattaneo M, Inbal A, De Moerloose P, Spreafico M. Rare bleeding disorders. Haemophilia. 2008 Jul. 14 Suppl 3:202-10. [Medline]. Nagler M, Kremer Hovinga JA, Alberio L, et al. Thromboembolism in patients with congenital afibrinogenaemia. Long-term observational data and systematic review. Thromb Haemost. 2016 Sep 27. 116 (4):722-32. [Medline]. Peyvandi F. Epidemiology and treatment of congenital fibrinogen deficiency. Thromb Res. 2012 Dec. 130 Suppl 2:S7-11. [Medline]. Ross C, Rangarajan S, Karimi M, et al. Pharmacokinetics, clot strength and safety of a new fibrinogen concentrate: randomized comparison with active control in congenital fibrinogen deficiency. J Thromb Haemost. 2018 Feb. 16 (2):253-61. [Medline]. Lissitchkov T, Madan B, Djambas Khayat C, et al. Efficacy and safety of a new human fibrinogen concentrate in patients with congenital fibrinogen deficiency: an interim analysis of a Phase III trial. Transfusion. 2018 Feb. 58 (2):413-22. [Medline]. Manco-Johnson MJ, Dimichele D, Castaman G, Fremann S, Knaub S, Kalina U. Pharmacokinetics and safety of fibrinogen concentrate. J Thromb Haemost. 2009 Dec. 7(12):2064-9. [Medline]. Disclosure: Serve(d) as a director, officer, partner, employee, advisor, consultant or trustee for: Novonordisk, Shire <br/>Received research grant from: Bayer Pharmaceuticals .